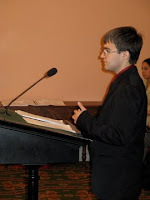 Christopher Meyer, a freshman at Capital University in Bexley, Ohio, heeded the call to action by AICUO staff when public testimony was slated for the House Higher Education Subcommittee this morning. Christopher is originally from Upper Arlington and had a couple different options when making his choice where to attend college in Ohio. Because of the assistance that OCOG provided him, he chose Capital University to continue his education. He is a biology/pre-med major with a minor in religion. Chairman Randy Gardner (R - Bowling Green) joked that in whichever path Christopher chooses, he will be a healer. Christopher testified before the five members of the subcommittee in the morning after hearing a few other witnesses before him give testimony on the healthcare pooling initiative within the budget. 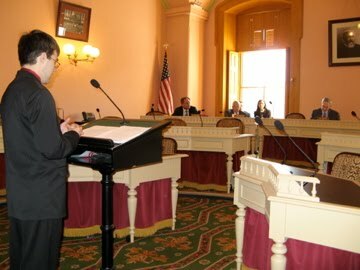 Members of the committee actually included the State Representative for his institution, Nancy Garland (D - Gahanna), who was very pleased to see a student from her district taking the initiative to do his part in the advocacy for this important program and wished him luck in his future endeavors. AICUO would like to thank Christopher for his efforts and taking the time from his day to advocate for independent college students in Ohio. Christopher's testimony can be found on the AICUO website, here.